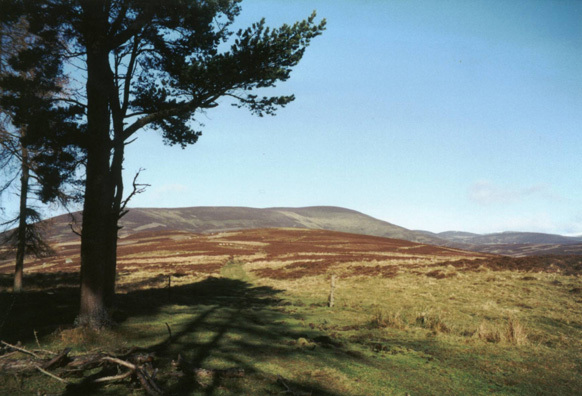 Badandun Hill Walk, Angus, Glen Isla, Glen Finlet, Kirkton, Glenisla, Loch Shandra. Everyone has them - those rather non-descript Sundays when, despite the best intentions the night before when the rucksack's packed and the sandwiches are made, an uncertain grey sky outside tempts you to spend rather too long lazing about in bed and, in the process, the notion of an early start is firmly knocked on the head. Badandun Hill in Angus is perfect fodder for just such an occasion. Perched between Glen Isla and forested Glen Finlet, an approach from Kirkton of Glenisla in the south is perhaps the most rewarding, taking in the tranquil fishing spot of Loch Shandra on the way out while the day's goal remains in view throughout. 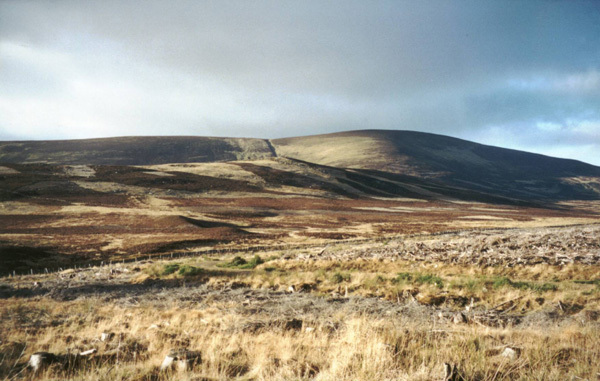 If you're a walker who lives by lists, you'll doubtless be pleased to note that Badandun Hill will reward you with a tick in the box thanks to The Grahams, a list of 224 Scottish hills between 2000 and 2499 feet high with a drop of 150 metres on all sides. There's a convenient car park at the start. The first mile or so follows the forest track north from the car park, skirting the base of the plantation-covered Cairn Hill up to the right. Some recent felling has opened up a few gaps in the blanket cover of larch and pine and it's easy enough to catch a glimpse of the naked summit of Crock poking up above the trees. 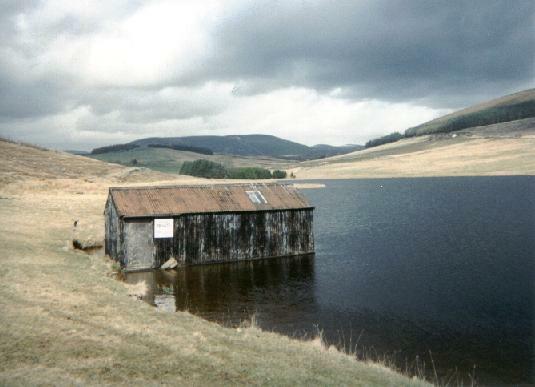 As you approach Loch Shandra, branch off through a pair of gates on the left and a track runs along the head of this man-made strip of water to a boathouse perched on the far corner. Curve right behind this and a grassy track heads north, passing a small strip of woodland down to the right. Newer plantations cover the slope above. Half a mile on from the boathouse, keep your eyes peeled for a less than obvious path dropping down to the right, just before the main track reaches a gate. This leads to a parallel gate below and, beyond this, there's a rather marshy section to negotiate as you cross a stream before rising over open grassland to the ruin of a cottage at Craignity. There's a fence above and, to the left of the collapsed structure, a wooden gate lets you through. Continue up the slope, through a field often used for sheep grazing, and set a course for the house at Craighead, clearly in view above. 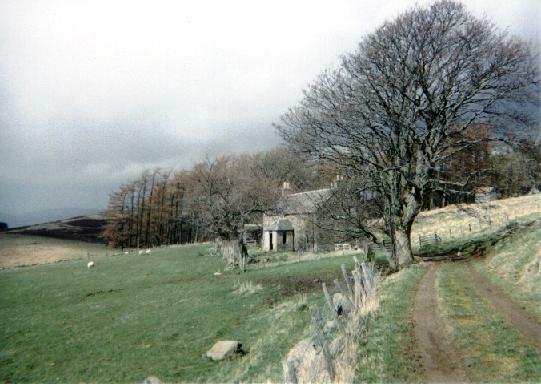 A gate at the top of the field marks the start of a short section of track which skirts behind this house. Derelict, it could be saved, making a charmingly remote dwelling, with great panoramas from the front room over Glenisla and to Mount Blair in the west. The way continues by a series of crumbling stone outbuildings used by the sheep farmer and at the end of these, swing right and head up past a small wooden shed perched on the slope behind, to reach a high gate. Go through, bear immediately right on the otherside and then left. A track skirts below an airy woodland of tall Scots Pines to emerge on to open hillside, the long shoulder of Badandun Hill in view ahead. A good path leads north through the heather, curving right, round a lump in the hillside, to join up with a more significant track a mile and a half on. Bear left and follow this a few hundred yards to a gap in a drystone wall. There's an unbroken view of Mount Blair (the one with the unsightly telephone mast on the summit) and the rippling stretch of tree-encircled water down to the left is Auchintaple Loch. Turn right at the junction just beyond the wall and walk north along the wall. In due course you will reach a gate. Go through and bear left, following the wall up to a post and wire fence which climbs the southern flank of Badandun Hill. This will act as your guide. 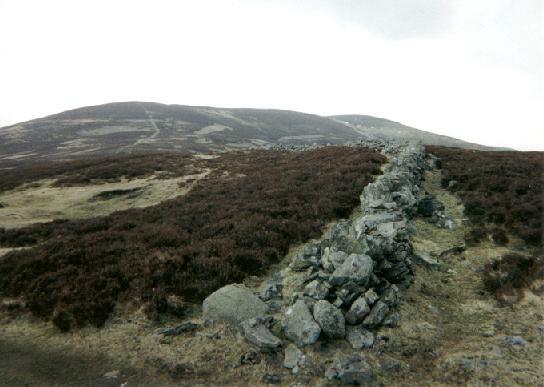 It skirts by a succession of grouse butts, gaining height steadily to a cairn at 643 metres where the slope flattens off. Bear right here and follow the line of a broken wire fence. There's every chance you'll see mountain hare here as the summit ridge seems to have a very healthy population nipping about and fairly sizeable herds of deer roam the slopes below. There are peat hags to negotiate, but the gradient is easy and, with a final pull at the end, the summit trigpoint and cairn are reached. 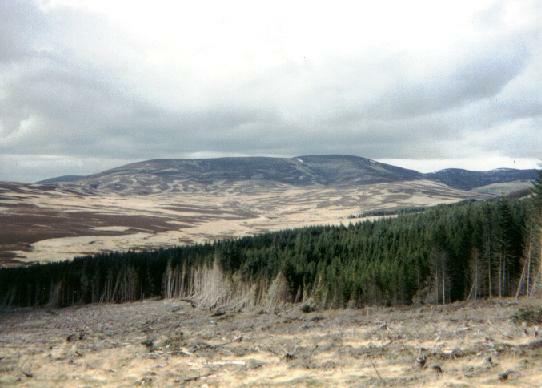 From the top, descend over the peak's south east shoulder and head for the edge of the extensive Glen Finlet plantation. A fairly new high wire fence borders, running parallel to an older one borders the woodland. When you meet up with the fence follow it south to a point where the new fence ends. It's possible to climb through here and ironically a stile has been provided in the old fence which, by this point, is pretty rundown. It's a pity nobody thought to put a stile on the new fence. On the other side, climb up a grassy ride over a felled area to join the main forest road at a junction nestling in the col between Bada Crionard and Craigie Law. The most direct route home from here is to take the track running to the right, south on the west side of Crock * (see Update). However, a much more pleasant alternative is to head up the forest road climbing towards Craigie Law. This makes a sharp left turn a short way on, but a grassy path carries straight on up through the trees. It flattens off shortly and continues through dense coniferous forest. The way is at its most dramatic when there's sunshine after rain, heat mist rising from the forest floor through the branches. A mile from the top of Craigie Law, the path emerges into the open as it approaches the summit of Crock, a small cairn marking the top from where there are panoramic views. The path drops back into the trees, meeting up with a stone wall lower down which should be followed until you emerge into a recently planted area. Stay with the wall and on the far side, skirt left round an area of tall pines then descend south-east across the hillside to meet the track serving Glenmarkie Lodge and follow this down to Freuchies. Start/parking Forestry Commission car park at Freuchies, a mile east of Kirkton of Glenisla (grid ref NO 224607). Access this by turning off the B951 a mile east of Kirkton of Glenisla on a narrow tarmac road signposted for Glenmarkie Lodge which advertises B&B and horse riding. Grading A long hike with good track and path for much of the way. The route passes over working grouse moors so avoid the grouse shooting season (August 12 to December 10) or go on a Sunday when there's no shooting. Update Your best bet at present is to take the direct route - as mentioned - home. Windblown and overgrown trees are blocking long sections of the way up to and down from Crock, making the going very difficult indeed. July 12, 2002.